Description: NO MAGAZINE SALES into NEW YORK CITY. CONNECTICUT residents must furnish us a copy of your CT State Permit. This listing is for ONE Magazine. 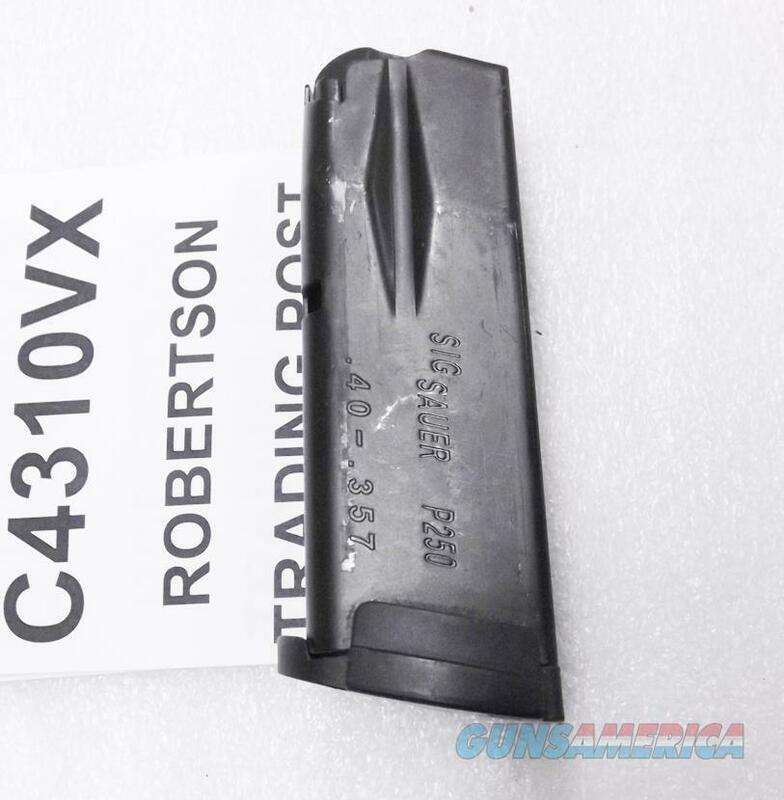 From light security duty in Upstate come these factory magazines to fit Sub Compact versions of the Sig Sauer P250 and P320 pistols that are chambered in .357 Sig or .40 S&W Caliber. Manufacturer was Mec-Gar s.r.l. of Gussago, Italy, under contract to Sig Arms Inc. of Exeter, NH. These are factory Sig magazines. Construction is one piece, heat treated folded steel body with upper section lateral serrations. Right side body is round count ported at 5 and 10 rounds. Springs are music grade 1 piece steel wire, with steel inner plate, and with polymer floorplate and cartridge follower. Each magazine holds 10 rounds of .357 Sig caliber, or .40 S&W caliber ammunition. These magazines are the flat plate, standard variants that fit in the P250C Sub Compact, or P320C Sub Compact only. They will NOT fit compact or full sized pistols because they are shorter than the service sized pistol's grip frame and magazine well. They will Not work in a 9mm or .45 ACP chambered pistol. Finish is smooth matte surface blued steel. Surface detractions are minimal to moderate, principally edge wear from carry in department issue magazine cases. We rate them as Very Good Condition, perhaps even Excellent, 85 to 90 percent vicinity by our estimate, but photos ought to suffice for our distinguished shoppers to judge finish grade for themselves. Spring strength is excellent, and brass deposits on followers minimal to moderate, as the photos show. We estimate these were in service for less than a decade, fired fewer than 500 rounds apiece. Replacement pricing is $46 per magazine on sigsauer com. We're offering the magazines in the photos, however, or their identical mates from the same agency, each	for only	$ 17.00. Not for sale to residents of New York City. Connecticut buyers must furnish us a copy of your State Permit.